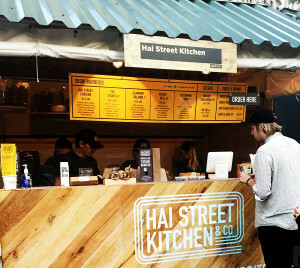 Hai Street Kitchen & Co, has hit the road! Now until Friday, November 13, 2015, we are happy to announce that HSKC is on location in the Big Apple. Now all you New Yorkers will have a chance to see how Philadelphia likes to #GetHai with Hai Street’s wide selection of Japanese-inspired sushi burritos. We’re so excited for Hai Street Kitchen’s first-time appearance at Broadway Bites. If you’re not familiar with #BwayBites, this seasonal pop-up market is taking place at Greeley Square Park (33rd Street & Broadway.) This event rounds up some of New York City’s most popular chefs and restaurants at one exciting outdoor location. But don’t worry, Hai Street is no stranger to the pop-up scene as a local participant in Rittenhouse Row Festival and OutFest. For more information, be sure to check out the great amNewYork’s review on HSKC in New York. ← Yo Pope Francis, Welcome to Philly!